This market demand situation is combining with the start of a strong ramp-up in wood availability as vast areas of new planting in the 1990s reach maturity. New planting levels in NZ peaked in 1994 at 98,000 hectares. 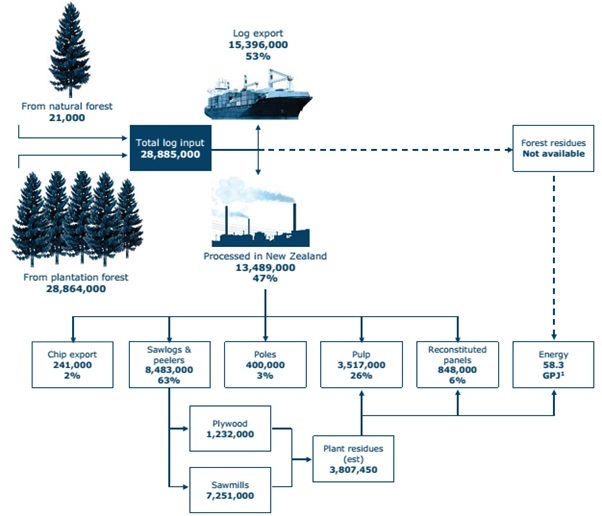 At a conservative 500 m3/hectare timber yield, this year of planting alone would produce 49,000,000 m3 of logs (about 160% higher than the current annual national harvesting of 30m m3). And then there is the increase wood availability for all the other years (1992-1999) during which there were also accelerated planting levels. Of course this increase in wood availability won’t all be harvested at once, but it will have a significant impact on the forest sector in general and owners of 1990s forests in particular. Click here to read more about the “Wall of Wood” and how it might affect you. PF Olsen notes that clients who participated in well-timed and well-executed carbon trading or those who opted to enter into leases with NZ Carbon Farming have done considerably better and added significant pre-harvest cash-flows to their forestry investment. According to Peter Weblin, Chief Marketing Officer for PF Olsen, depending on the age, age-class mix and prior involvement in the Emissions Trading Scheme (ETS), there is potential to boost next-rotation investment returns from participating in the ETS. This benefit will get an additional boost if the government adopts the proposed “carbon in wood products” and “averaging” rules into the ETS. This adoption is considered reasonably likely.